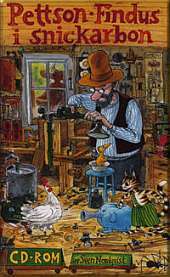 In this second game in the series of games based on the popular Swedish kids books (known in English as "Festus and Mercury"), you find yourself as the carpenter Pettson with his cat Findus. In the carpenter's shop, there are games to play, and treasures to find. When you win a game, you get a gold feather placed in a treasure chest. When you have 10 gold feathers so you can switch them to gold. Before starting to play, choose one who will guard the treasure chest. Each guardian has a different profile. There are eight guards to choose from. There is plenty to do: find five brethren, pluck sausage, trap the mice inside, play noughts, play with a music station, your own treasure trove and share your inventory.